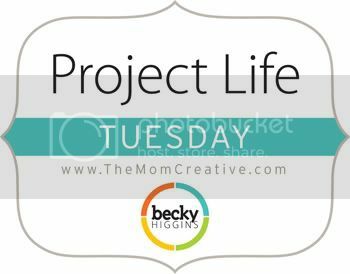 Welcome to Project Life Tuesday 2014 If you are new to The Mom Creative, welcome. I hope you will stay awhile. I’m Jessica – wife to Matthew, mom to Elias, a silly and spirited five-year-old, and Adeline, a spunky two-year-old. I’m also a marketing professional, savvy deal finder, photo lover and memory keeper trying to juggle it all. Each Tuesday, I share my most recent spread as well as host a linky for readers to link up their pictures/layouts. Some links are affiliate links. Today I am sharing the last two and a half weeks of my 2013 album. Because there were so many pages, I am only post large spread photos. For this first spread you can see the Design A spread on the left, plus the Design J and part of another Design A page on the right. I maintained the same Elf on the Shelf style for the whole month of December. Really love it each week. Here’s the next spread. In all of these pages, you can see that I kept things very simple, focusing on simply getting the photos in and stories documented. No fancy embellishing. I did cut a 6×4 photo in half to insert it into two 3×4 pockets, which is a nice technique to do when you have too many horizontal photos. 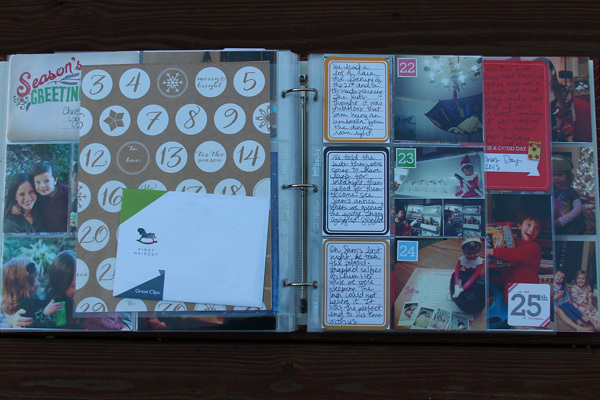 For this last spread, I actually did 10 days so I could more easily finish the whole year on a horizontal spread. It worked perfectly. 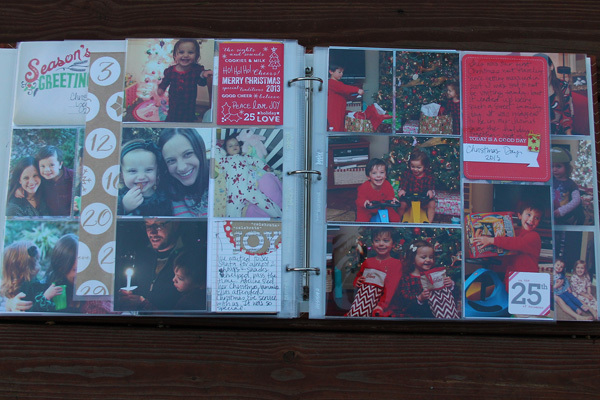 Each year I always include our Christmas card and letter in my Project Life album, so you can see those here as well. On the back side of the letter, I inserted some Christmas cardstock, as well as an envelope with some of Adeline’s locks from her first big haircut. On the opposite page you can see the weekly Elf pictures again. Here you can see the back of the Design J page, which were all Instagrams, plus the Design G insert I did for Christmas morning. 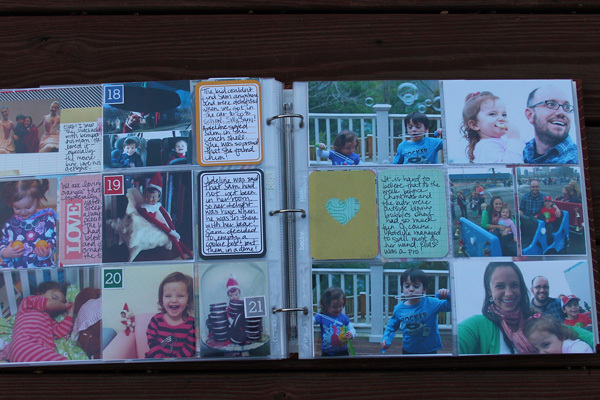 For this page I used two 4×6 journaling cards to write about the day (one on each side). Here’s the last spread I have to share. Again nothing fancy, but a wonderful end to a great year! 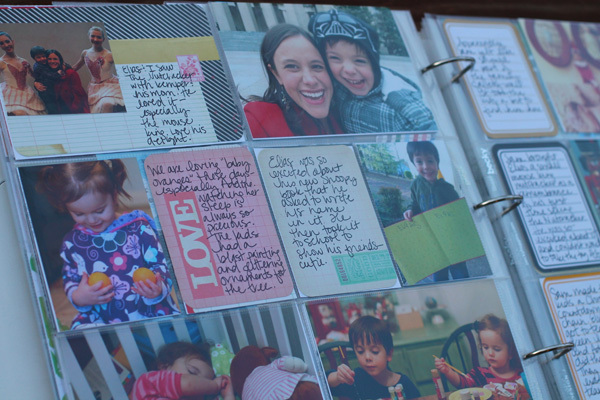 Next week I will be sharing my plans for Project Life 2014, so I hope you will join me again. Your turn to link up! Also, just a friendly reminder to please remember to link back to The Mom Creative in your posts. Thank you! 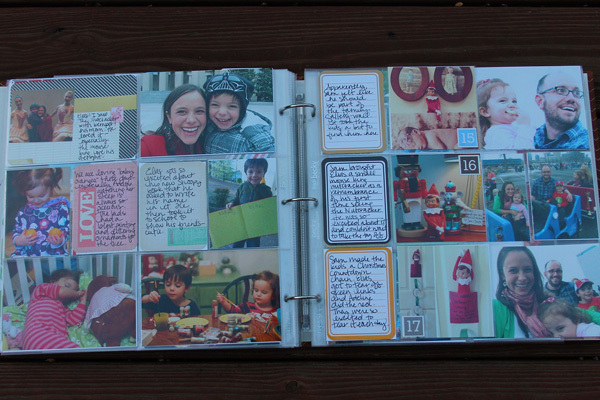 I absolutely adore how you added the Elf on the Shelf inserts. It sure makes me wish mine were still young enough to play along. I love how you included Elf on the Shelf. That protector really is perfect for it. Our elf was horrible this year, didn’t want any pictures, showed up late, forgot to move. Hopefully I’ll be better this year! 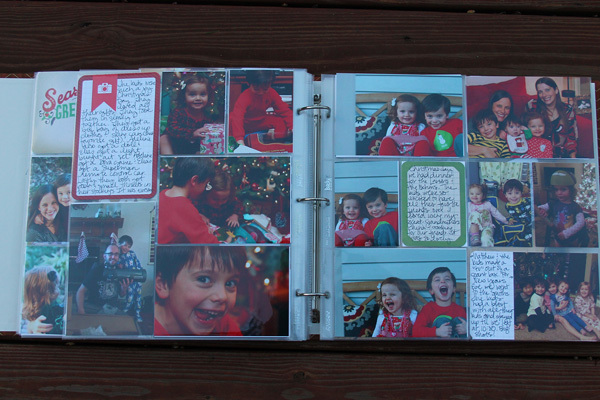 I still have Christmas to do in my 2013 Project Life book. I loved looking at your photos and pages. You have a beautiful family. Thanks for your kind words. You are in the home stretch if you just have Christmas to do! Lovely spreads to end the year. I’m just starting on 2014 too. Can’t wait to see what you have in store for 2014. I’m excited to share. I am shaking things up a bit! Love your pages! The elf on the shelf is precious.. my kids are a little old for it, 11 and 13, but I may just have to do it next year anyhow after seeing your photos! Too cute! 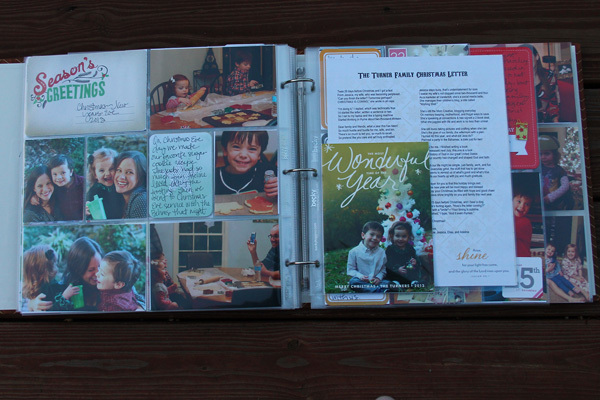 Thank you for all the inspiration and looking forward to seeing your 2014 spreads. Thanks for keeping your layouts simple! I’ve been working on my PL pages these past few days and they are totally simple and to the point! !